Going for an investment banking position? 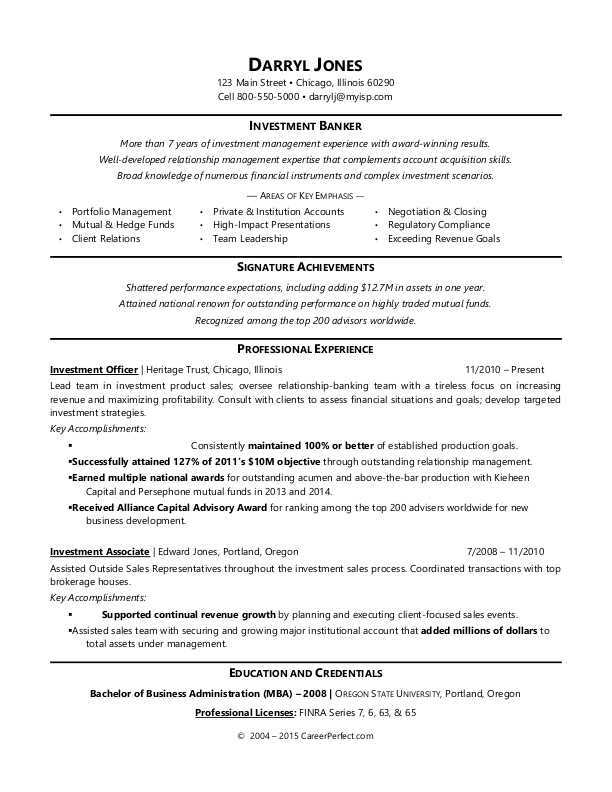 To communicate your credentials, view this sample resume below, and download the sample resume for an investment banker in Word. And if you need more help, let the experts at Monster's Resume Writing Service create a high-impact resume for you that will impress employers. Jobs for investment bankers are projected to grow by 6% (or 23,300 jobs) from 2016 through 2026, according to the Bureau of Labor Statistics (BLS). You’ll find the highest level of employment for this job in the following states: New York, California, Texas, Florida, and Illinois; and in the following metropolitan areas: New York City, Chicago, Los Angeles, Dallas, and Houston. In this job, you can expect to make a median wage of $63,780 per year, or $30.66 per hour, according to the BLS. Additionally, you can learn more about banking careers and search for jobs in financial services or banking on Monster.